Grind sugar and xanthan. Sprinkle into water, rose water and lemon juice with hand mixer on full speed. When the xanthan is dispersed add methyl cellulose a little by little with the mixer still on. Mix for another 5-10 minutes until bubbles are small and uniform and the foam is dense and stable. If desired the foam can be whipped with an iSi whipper charged with nitrous oxide. 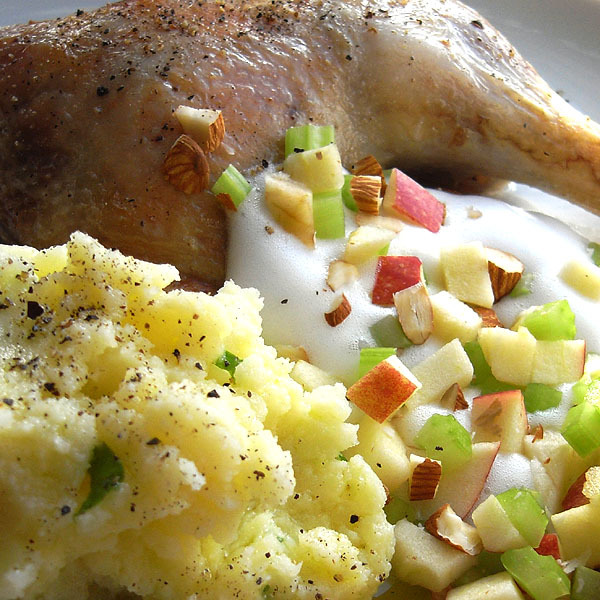 I served the rose foam with diced apples, stalk celery and chopped almonds as a side dish to roasted chicken. Mashed potatoes with basil leaves, topped with a good olive oil and ground pepper was nice with the chicken. Verdict: The rose foam is thick and lucious. The rose aroma blends very well with apple aroma. Lemon, almonds and celery give a nice contrast. The overall combo was a pleasant surprise! My previous encounters with rose water have been somewhat overpowering (especially in food from the Middle East), but the rose foam was much milder as I had diluted it with plenty of water. The foam is stable on the time scale of minutes to hours. When left overnight the bubbles coalescese, but the volume of the foam remains more or less the same. Foam from the previous day can easily be whipped up again with a hand mixer. 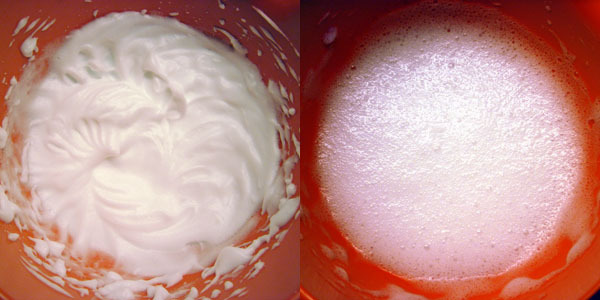 Newly whipped rose foam (left), 18 hours later the bubbles have coalescesed (right). I apologize for the somewhat weird colors. Spill the whole packet of salt in a clean baking dish – the thickness of the salt should be approximately a 1 cm. Split the chicken’s rip cage and open the chicken, so it can nicely lie down in the baking dish. (Do not salt the chicken!!!) Place it in the baking dish just as it is – face down (or I should say belly down). Bake it in the oven for approximately 1 hour and 20 minutes at around 250C. The chicken gets really really soft with very interesting flavor, reminding of hot summer evenings at the sea. It is almost rudimentary to pair this chicken with a pint of light beer.